Working in vivid hues, Somenath Maity explores light and geometry on multiple planes. This busy canvas beautifully conveys the city's throbbing heartbeat in an ever-changing study of shape and color. Sadhana Jaipuria presents the artwork as an archival giclée print on canvas as a part of her gallery's collection. Born in West Bengal in 1960, Somenath Maity studied at the College of Visual Art and completed a diploma course in Fine Art from the Indian College of Art in Kolkata. 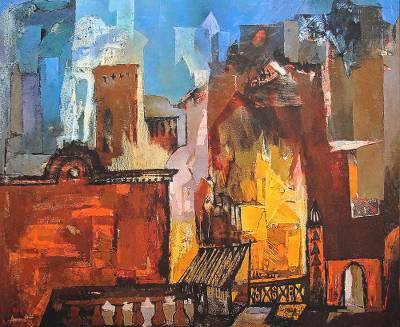 The award-winning artist has exhibited his work in Indian cities as well as in Germany, Sweden and the UK. You can find giclée print on canvas 'Structure II' by Somenath Maity by Sadhana Jaipuria in paintings categories such as Cityscape Paintings, Abstract Paintings and Print Paintings. Enjoy exploring these sections for other Novica treasures.